Technology is ever growing and new trends are emerging. If achieving a profitable business is what one would like to choose, being on par with the advancement in technology is the ultimate way. The business IT infrastructure should be able to adapt to the new changes and act accordingly for the business to seek profit and survive. Organizing the infrastructure with the structured cabling is well-proven to be beneficial for the business since it is capable of adapting to the emerging trends and technological needs of both present and the future. If the business can adapt the structured cabling solutions for designing its IT infrastructure, there are good chances for the maximum benefit. Most businesses are associated with telecommunication needs like voice, data, video and other electronic modes of communication. The present day’s telecommunication needs are massive that adhering to the old cabling solutions would be far from being feasible. The cabling solutions employed must meet the present day’s vast growing telecommunication needs as well as the future changes in the telecommunications. 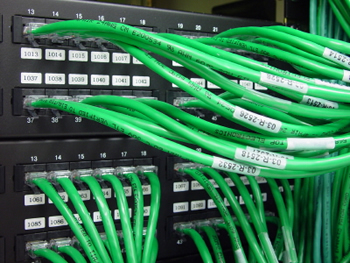 The structured cabling system is coherent with technology and as part of this inherent quality, it offers adaptability. Applying the structured cabling solutions for building up the IT infrastructure is a smart business strategy. Actually, today’s data, voice and video systems are necessitated by a high-quality, performance-oriented ucabling solutions for the infrastructure. The structured cabling solutions are capable of offering high bandwidths for accommodating high data needs and integrating new technologies at the same time, acting like a backbone for the business to be successful. The overall costs you will have to bear on setting up the infrastructure are also reduced as well. The businesses can expect the optimal output and save on expenditure at the same time. Understanding the exact requirements of the infrastructure to decide on what is most suitable for the infrastructure is a deal of expertise and VRS Tech is a structured cable installation provider for the same. Our skilled engineers will design your infrastructure with premium tools along with advanced techniques for the business to reach its potential level. We ensure the overall costs of the cabling solutions are reduced with the help of our cost-effective structured cabling suppliers. Contact VRS Tech at +971 56 7029840 or refer to our website http://www.vrstech.com to get a clear picture of what we have in store for you.